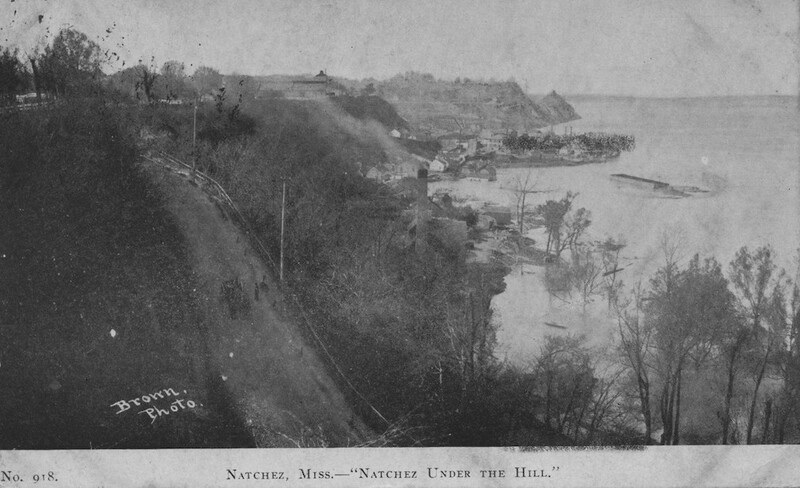 Natchez-under-the-Hill is the area of Natchez below the bluffs overlooking the Mississippi River. Like other river towns in the frontier Southwest, Natchez-under-the-Hill was notorious for lawlessness, debauchery, and violence. Residents and officials alike were appalled and attempted to clean up the area but had little success until the 1830s. Brothels, gambling houses, and saloons under the hill catered to boatmen, travelers, and poor whites. The flow of alcohol from these establishments often led to fights over women, cheating at cards, or even simple misunderstandings, and an insult or wrong look might result in fisticuffs. Many Natchez whites lamented these activities and worried that such men would encourage slaves to gamble and drink. Indians and slaves sometimes frequented establishments at Natchez-under-the-Hill, and white critics often complained about both drunkenness and interracial fraternization. Natchez officials during both the Spanish and American periods used legal means in attempt to reform Natchez-under-the-Hill. Manuel Gayoso de Lemos, Spanish governor of the Natchez District, issued laws in 1792 that banned gambling, public rowdiness, and liquor sales to slaves and Indians under the hill. Gayoso also instituted a curfew, but the Spanish could not enforce those laws. The Mississippi territorial government restricted the sale of liquor to Indians beginning in 1798, and Gov. Winthrop Sargent remarked that Natchez had become an abominable place. The Mississippi Territory passed a 1799 law regulating slave activity on Sundays. Sometimes what went on under the hill spilled over into Natchez proper. In 1807 boatmen came up from the landing and rioted in the town, and one person was killed. A more serious incident occurred in May 1817 when a mob of Kentucky boatmen seized control of the landing but soon began fighting among themselves. The three-day riot ended only when the Kaintucks, as the boatmen were called, surrendered in fear after Natchez officials aimed a cannon at the rioters from the bluffs above. “Respectable” citizens blamed these instances of violence and rioting on the vices common in Natchez-under-the-Hill. In 1816 the city government expelled most of the prostitutes who worked in the area, placing the women on boats and taking them to other ports. Nevertheless, many returned, and new prostitutes were always arriving. The same attitude applied to gambling. In July 1835, for example, city authorities demanded that gamblers vacate the landing within twenty-four hours. Men and women, along with various kinds of gambling equipment, were seen leaving on the Citizens’ Rail Line, but many returned. Natchez citizens blamed gamblers for a series of fires that began under the hill and spread to the city. In January 1836, twenty-eight houses caught fire and burned at the landing. These fires threatened the city and incited fear among townspeople, who extinguished the fires and saved the city. Some whites believed that slaves had started the fires, and the number of slave patrols was increased markedly in hopes of preventing any further rebellion. Other observers believed that the real culprits were gamblers bent on revenge after having been forced to leave. In the 1830s Natchez finally gained headway in cleaning up under the hill. Although gambling still existed in the area, it continued on a much reduced scale. Many gamblers had departed for New Orleans, Memphis, or Vicksburg, and a number of saloons and brothels had closed and been replaced by commercial establishments. Yet boatmen still stopped under the hill. In his diary, William Johnson mentioned that a group of Irishmen rioted over the city’s tax on flatboats in December 1836. Even today, gambling remains a big attraction under the hill, where riverboat casinos now draw visitors—legally.